My husband and I looked at this venue and instantly fell in love. We stopped searching for a wedding venue and immediately booked! There are so many options for creating your wedding day. They really worked with us on our budget and made us feel like we were still getting a million dollar dream wedding. For 10 months, from day one to the day of, everyone at the Sterling Castle kept in contact with us to make sure our wedding day was everything we wanted. Every single detail was taken care of, and any questions we had always got an answer. I can’t thank them enough for being so responsive, caring, and reassuring that we would have our dream day. It was truly beautiful and more than I even expected. Misty is incredible with decor and details! Brennan and Victor were also amazing. Brennan handled all our music. I picked out all the songs for our ceremony and first dances, and they all flowed flawlessly. During our first dance, we got a surprise by gorgeous little bubbles falling all around us from a bubble machine Brennan had up above us on the balcony. It was the perfect last minute detail that really made our first dance extra special and beautiful! Words cannot describe how magical this experience was for me and my family. A week later and it is still all anyone is talking about. Words like magical,breathtaking, once in a lifetime, true love is how our wedding has been described, Misty and Victor are so wonderful and so obviously in love. They really bring together the whole once in a lifetime fairly tale experience. Brennan and Kelci are also so great. The whole family is personable, warm, and understanding they truly are down for anything nothing is too big or two small. We are die hard nerds in our family. They tied all the elements and essence of our relationship into one big jaw dropping amazing ceremony. 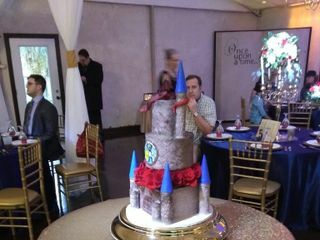 Every single person employed by the sterling castle are shinning stars the caterers, the cake designer our officiants etc. Who Work so tirelessly for your day. You will never find a more open minded and just genuinely wonderful team of people. If you are like me the idea of planning a wedding is overwhelming and I dont even know were to begin. You can be as hands on or hands off as you want to be and I so enjoyed that. I have been told by everyone in attendance that this was the best wedding anyone including my photographers have ever seen. It wasn't just a wedding it was an epic adventure from the first visit to the big day! Nothing short of magic. I cannot even express how amazing everything that Misty, Victor, Kelsi, Brennan, and everyone at the Sterling Castle did for us. From day one they were so accommodating, patient, and, loving towards us and our families. They made every dream we've had for our wedding come true and far exceeded every expectation. They made everything seamless and absolutely beautiful for us. Our theme was Lord of the Rings, and they took that and made everything we dreamed of a reality and then took it even further. We could never be more grateful and appreciative for how much they did for us. We are happy to consider them part of our family, and we will always remember our wedding day because of the hard work and dedication they put forth to make sure we had an absolute fairy tale wedding. Thank you for being LGBTQ Friendly and accepting us into your family and making everything about our wedding day absolutely beautiful and perfect. Our wedding day was perfect! Misty and Victor went over and beyond to make our big day a dream come true. Everything ran so smoothly and was breathtaking. If you are looking for a venue with a beautiful atmosphere, professional staff, and worry-free experience, call Misty and Victor. You are in good hands!!! Sterling Castle will make your dreams come true. The Sterling Castle is the perfect place and Misty and Victor are the perfect hosts. They are flexible, attentive, gracious and will make sure your wedding is stress free. The wedding cake was awesome. Everything was beautiful. We even had fireworks. 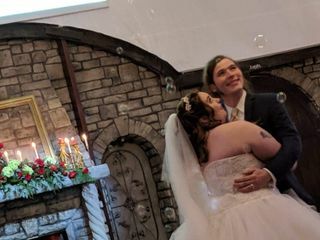 Our wedding was absolutely amazing. Misty, Victor, Kelsi, Brennan and their host of of hand selected vendors and family made our memorable day beautiful and stress free. These are kind, honest people who truly enjoy making dreams come true. Throughout the entire process we felt like we were so much more than just customers. 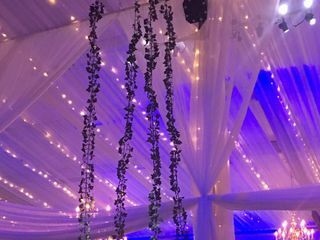 Misty and Victor expertly captured the look and feel we were going for and stunned us all with the decor and preparations, they really turned our ideas into reality. The castle and surrounding grounds are beautiful, you can't ask for a more perfect setting. When it started to rain they seamlessly adapted and kept everything moving smoothly, proving even mother nature couldn't dampen our day. Even after the wedding we're finding out from our guests that there were so many little personal touches that we didn't notice, from helping a tired guest around with a wheelchair to making sure that everyone felt included. If I listed out everything that we loved this would quickly turn into a novel, to sum it up they made sure our day was very special and unique. Looking back we can't imagine going anywhere else! at the castle was AMAZING! Misty, Victor and their son Brennan treated me like family. Anything that I requested for my big day was made available to me. They will always have a special place in my heart!! Thank you so much for helping make my wedding day EXTRAORDINARY!! 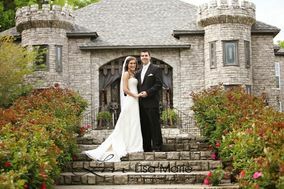 I recommend if your getting married and you want it to be held at a beautiful CASTLE ....THE STERLING CASTLE is it!! Where should I start! Sterling Castle's entire staff is simply amazing. From day one, the son explained his parent's love story, how and why they built the castle and when they decided to share their home with engaged couples such as I! I will always remember the 1st conversation because after that 1st call, I only had to call one other time! Everything we discussed then came to fruition; My wedding day was perfect! The venue was lovely, food and cake excellent and the atmosphere far exceeded my expectations. I can say my husband and I got our money worth and some! I NEED TO SAY AGAIN, the venue was amazing! Also, Misty coordinates the wedding really well, my family stated she had a kind spirit. Victor made sure the fog and fireworks were eye catching and heartfelt. Lastly, their son Brennan was a Great DJ. I can go on and on about how wonderful my freestyle wedding turn out thanks to the help of Sterling Castle dreammakers. Planning an out of state wedding is hard enough for anyone, but with the help of Misty, Victor, Brennan, and Kelsi, this bride was stressed free. I started that I wanted everyone to have a great time. Wish granted. Everyone said what an amazing time they had. Even my grandmother stated that it was worth every penny. When my dad passed away in the middle of planning, they stepped back to allow me to heal. They even helped me create ways to honor my dad. The food was amazing, the DJ kept everyone dancing, Dr. Graham ( our officiant ) was apart of everyone's family by the end of the night, my bridal bouquet was better than the pictures I sent. I could write a book on how amazing The Sterling Castle is, but don't take my word for it. Find out for yourself. Brides you have found your venue, Groms who are not in to details, this is your place. The staff helps turn your dreams into reality, and creates memories of your wedding day that will last a lifetime. BOOK NOW you will not be disappointed. 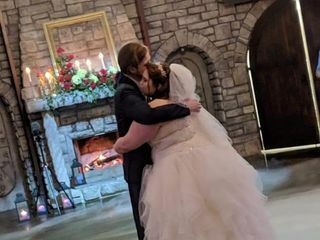 Our wedding was March 31, 2018 at the Sterling Castle and I am so glad we chose this venue along with Victor, Misty, Kelsi, and Brennan. 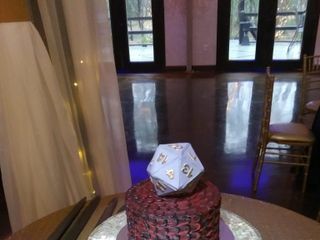 So many guests have told me this was the most fun wedding they have ever been to! It was such a relief leading up to the wedding to not have to worry about decorating or food or cake, or anything for that matter. If I had to do it all over again I wouldn't change a thing. The ceremony area was gorgeous and the flowers were so perfect! The reception area was greater than anything I could have hoped for (or anything I could have planned myself). Everything was so stunning and elegant! It was a perfect day. Thank you so much Binkerd family!!! I would recommend this place to anyone seeking a professionally planned wedding. Food was excellent, Venue is great, Misty and her family are very accommodating and know how to make things run smooth and efficient. Weddings are usually stressful, yet they made this as stress free as was possible. I would rate them higher, but 5/5 is all they allow. My hat goes off to Misty and Victor on a well planned, perfect day for my Bride and I.
Victor and Misty were great to work with! It was so nice to not have to run around and piece everything together. The venue was beautiful and all of the decorations fit perfectly into my daughter's theme. They took care of all the details to make her special day as stress free as possible for all of us! There were a few issues, but they rearranged and made changes to correct the issues. I only hope I can find another venue as good as they are when the other daughter get married! I certainly recommend them! I work full-time and am new in my career, so though I wanted a fairy-tale wedding, time was not on my side. That is, until I found the lovely family of Sterling Castle! The Binkerd's took my vision of an English Romantic wedding and turned it into something even dreamier. From the flowers to the table decor, everything was perfect. My husband and I are so happy to have started our Happily Ever After at the Sterling Castle! Thank you!!! My husband and I came to Misty with a Harry Potter vow renewal theme and they ran with it and made it a sight to be seen!! Misty/Victor, and Brennan, were beyond the best hosts, planners, and people (and the Sterling Castle the best location) that we could ever hope for - all in one place! DO NOT underestimate what they are capable of or their abilities to understand EXACTLY what your vision is and so much more than you could ever dream up on your own. I do not mean anything towards the planners out there in the area, but I just cannot imagine ever having a better planner or visionary tha Misty and I am someone who is hard to impress. I truly could not ever express our gratitude to them for making our day perfect! Our family was blown away and had the best time they had ever had at any wedding which is more than I could hope for. Whether you are wanting a themed wedding or something elegant or simple, Misty will dream it up for you; Victor can create the most amazing props and effects; and the whole family will come together to do all they can to make it perfect for you! You may not opt for wands, butterbeer, pumpkin juice, winged keys, and floating candles, but no matter your dream, you cannot go wrong by choosing the Sterling Castle! The Sterling Castle was everything I was looking for in a wedding venue and more. Misty, the Fairy Godmother, was incredible. We kept in touch through the entire planning process and the flexibility was amazing up until the last minute. Not only is the Castle great for photo-ops, they do the entire set-up and tear-down for you! Your only job? Show up and smile. Thank you all so much! We had a great gatsby wedding on NYE, and The Sterling Castle gave us everything we had hoped for plus some! I would recommend this place over and over. The best venue with the greatest people! We have amazing memories thanks to their hard work. Everything was handled for us which takes so much of the stress off. I would recommend this venue to anyone! It's so worth it! The Sterling Castle Crew made our day so beautiful and easy! We didn't have to do anything but show up and have fun! 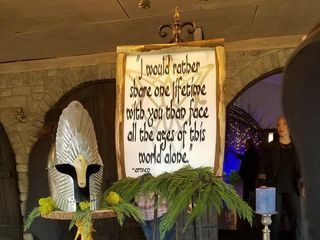 We had a Lord of the Rings themed wedding and they made it happen! 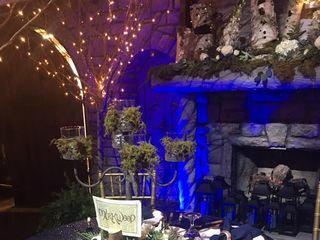 I would recommend The Sterling Castle to anyone that wants a special and unique wedding. It's a family business. They are very welcoming and make you feel like part of the family. Thru are also very flexible and open to suggestions. Misty is amazing. She is a master coordinator and decorater! Working with Misty was awesome! She and her family took care of everything on a short notice, had recommendations, and made sure I didn’t have to worry about anything. We had a small elopement wedding, didn’t cost us a fortune, but was elegant and dreamy. My fiancé and our children could not have been happier with our day! I would recommend this venue to anyone! We had a perfect fairytale wedding and made wonderful memories for our family! Misty, Victor, Kelsi, and Brennan made our day as stress free and magical as I could have ever imagined. It was the most fun I’ve ever had at a wedding and it’s not because it was my own. Choosing The Sterling Castle as your wedding venue is worth the drive! The team at The Sterling Castle were the absolute best! Misty, Victor, Kelsi, and Brennan do such excellent jobs. They cater to your every need and go above and beyond what is expected. Our wedding was the most magical night for us, and it was all because of them. I’m so happy I found about the Sterling Castle! I highly recommend anyone desiring a truly exceptional wedding to see them!! Misty & Victor are amazing!! We set up a time to check out their venue and as soon as we walked the grounds we knew it was the perfect place for our special day. They are with you every step as you plan your big day. We planned our wedding in such a short amount of time and not once did they make us feel rushed or pressured to make decisions. Thanks to Tropical Storm Nate, we were unsure of how our day would unfold. Victor went out of his way to find extra generators in case we needed them but luckily the power came back on and our wedding was absolutely perfect. They make you feel absolutely welcome and relaxed. The Castle is breathtaking and I am so anxious to see the rest of our photos. Thank you Misty & Victor for such a great experience! If you are looking for a venue that is stress free and beautiful, I highly recommend The Sterling Castle!